Geelong LS Apr.20 Eltham W.
North Gold Coast Seahawks (QBL) inked 28-year old American ex-international power forward Deja Middleton (193-90, college: Fayetteville State, agency: Gamble Sports Management). She played recently at Kibirkstis in Lithuanian Moteru Lyga. In 6 games she recorded 12.5ppg, 8.5rpg, 1.0apg and 1.3spg this season. Middleton's team won Lithuanian Moteru Lyga Regular Season. Among other achievements she received Eurobasket.com All-Turkish TKBL Defensive Player of the Year award back in 2016. Middleton was a member of USA Senior National Team in 2016. She is a very experienced player. Middleton has quite traveled the world as her pro career brought her to eight different countries on four different continents (Europe, Asia, Australia and of course North America). Middleton has played previously professionally in Czech Rep., Latvia, Lebanon (Chabibeh), Poland (KS JAS FBG Sosnowiec), Czech Republic (Basket Slovanka MB), Australia (Knox Raiders) and Turkey (Tekirdag). Worth to mention she played also at Eurobasket Summer League, which helped her to get the job in pro basketball. She attended Fayetteville State until 2015 and it is her fourth season in pro basketball. American Laina Snyder (185-F/C) put on an amazing game in the last round for Willetton T. and that's her to receive a Interperformances State League Player of the Week award for round 7. The power forward got a double-double of 28 points and twenty assists, while her team beat Lakeside L. (#2, 4-1) 76-67. Willetton T. is placed at 4th position in their group in Australian State League. They would have been even better if they hadn't lost a few games earlier this season. Willetton T. will need more victories to improve their 4-3 record. In the team's last game Snyder had a remarkable 56.3% from 2-point range. She just recently signed at Willetton T., being already a very valuable addition to the team. Laina Snyder averages just after three games 17.7ppg, 6.3rpg and 7.3apg. The second most remarkable performance in last round's games was 23-year old center Jessie Edwards (192-C-95) of Albury LB. Edwards impressed basketball fans with a double-double of 32 points and 17 rebounds. Of course Albury LB cruised to a 92-81 relatively comfortable win over the lower-ranked Diamond VE (#13, 1-3). This victory allowed Albury LB to move up to 6th position in NBL1. Her team lost some distance to top teams. But 2-1 record is not bad and everything may still change. Edwards is one of the most experienced players at Albury LB and has a reputation of one of team's most reliable players. The third best performed player last round was Aimie Clydesdale (177-G-93) of second-ranked Dandenong R.. Clydesdale showcased her all-around game by recording 28 points, six rebounds and seven assists in the last round. She was a key player of Dandenong R., leading her team to a 90-73 easy win against Ballarat R. (#17, 0-3). Dandenong R. started extremely well this year. They recorded 4 victories without losing a single game in NBL1. Clydesdale turns to be one of the very best players in the league while she is also a leader of the top team having her eyes on the championship title. Clydesdale has a very solid season. In 4 games in Australia she scored 20.8ppg. The round was rather attractive and full of interesting results. The round ended with favorites losing the games and games ending by tiny margin. Here is the last round review presented by LBM Management. The game had a very big importance for second-ranked Wanneroo as it allowed them to take a leadership position in League. Wanneroo defeated 8th ranked Hawks in Joondalup 69-59. Wanneroo made 18-of-23 free shots (78.3 percent) during the game. American forward Kayla Steindl (187-89, college: Gonzaga) fired a double-double by scoring 20 points and 11 rebounds (made all of her seven free throws) for the winners. Forward Amy Kidner (183, college: N.Colorado) chipped in 14 points and 6 rebounds. Power forward Sarah Donovan (188-93) produced a double-double by scoring 17 points and 11 rebounds for lost side. As mentioned above they are alone now at the top position. Hawks at the other side dropped to the ninth place with three games lost. Hawks will play next round against strong Tigers trying to get back on the winning streak. Wanneroo will try to continue on its current victory against fifth ranked Flames in Rockingham. Undefeated Geelong Supercats (2-1) recorded its first loss in Seaford. Visitors were edged by seventeenth ranked Frankston Blues (1-2) 65-64. Worth to mention a great performance of Stephanie Reid who helped to win the game recording 18 points, 6 rebounds and 7 assists. JoAnna Smith contributed with 17 points and 8 rebounds for the winners. The former international forward Sara Blicavs (188-93) answered with a double-double by scoring 16 points and 16 rebounds for Geelong Supercats. Frankston Blues left bottom position moving up to twelfth place in League. Geelong Supercats at the other side dropped to the eighth position with one game lost. Frankston Blues will play against league's leader Lady Braves in Bendigo in the next round and it will be quite challenging to get another victory. Geelong Supercats will play at home against Wildcats (#7) and it may be a tough game between close rivals. An interesting game was played in Dromana where Jets (#7) crushed host Sharks (#6) with 47-point difference 86-39 on Saturday evening. It was a great evening for Geralynn Leaupepe who led her team to a victory scoring 32 points and 9 rebounds. At the losing side Megan Smith responded with 19 points. Jets (3-2) moved-up to fifth place in League. Loser Sharks dropped to the seventh position with three games lost. Both teams do not play next round, which will be an opportunity for some rest. Very important is a road loss of third ranked Wildcats (2-1) against seventh ranked Spectres (3-2) on Friday night. Visiting Wildcats were defeated by Spectres in East Burwood 89-72. It was an exceptional evening for Eliza Chilcott who led the winners with a double-double by scoring 16 points, 10 rebounds and 7 assists. Both coaches used bench players which allowed the starters a little rest for the next games. Spectres moved-up to fifth place in League. Wildcats at the other side dropped to the seventh position with one game lost. Spectres will have a break next round. Wildcats will play on the road against Geelong Supercats (#8) and it may be a tough game between close rivals. Very important is a home loss of first ranked Lightning (4-1) against fifth ranked Tigers (4-3) on Friday night. Host Lightning was defeated by Tigers in a tough game in Bullcreek 67-76. Laina Snyder fired a double-double by scoring 28 points, 20 assists and 4 steals for the winners. Lightning's coach rotated ten players in this game, but that didn't help. Tigers moved-up to fourth place in League. Loser Lightning dropped to the second position with one game lost. Tigers will face Hawks (#9) in Floreat in the next round which should be theoretically an easy game. Lightning will play on the road against Cougars (#8) in Hamilton Hill and hope to win that game. In League McKinnon C. lost to undefeated Hume City B. in Tullamarine 45-92. Winless Warrnambool was smashed by Keilor T. at home 49-99. Casey C. destroyed Bulleen B. on the opponent's court 90-55. Albury LB managed to outperform Diamond VE in a home game 92-81. Winless Ballarat R. lost to undefeated Dandenong R. on the road 73-90. Hobart H. lost to winless Launceston T. on its own court 95-104. Bendigo LB beat Kilsyth LC in a road game 70-64. Winless Sandringham S. was destroyed by Knox R. at home 67-92. Melbourne T. managed to outperform Waverley F. on the opponent's court 72-69. Knox R. rolled over Melbourne T. in a home game 104-72. Kilsyth LC lost to undefeated Ringwood H. on the road 51-68. Mt Gambier smashed N.Adelaide R. on its own court 87-62. Southern T. lost to Eastern M. in Mt. Barker 66-78. Woodville W. unfortunately lost to Sturt S. at home 56-70. S.Adelaide P. managed to beat C.Districts L. on the opponent's court 77-67. Norwood F. was crushed by Forestville E. in a home game 49-71. Cockburn C. was beaten by SW Slammers on the road 68-61. Winless East Perth E. was destroyed by SW Slammers on its own court 43-78. Kalamunda E.S. managed to outperform Cockburn C. in a road game 78-68. Warwick S. managed to beat Mandurah M. at home 85-72. Joondalup W. defeated Kalamunda E.S. on the opponent's court 80-66. Norths Bears beat Penrith P. in a home game 75-57. Sydney C. lost to Bankstown B. on the road 44-52. Manly Warr. SE lost to undefeated Newcastle H. on its own court 49-89. Cent.Coast C. was rolled over Hills H. in Baulkham Hills 55-87. Hornsby S. defeated Maitland M. at home 72-55. Canberra C. II was beaten by Sutherland S. on the opponent's court 82-73. Cent.Coast C. was destroyed by Norths Bears in a home game 37-82. Sutherland S. was outscored by Bankstown B. on the road 71-52. The best stats of 7th round was 22 points and 10 rebounds by Cassidy Mihalko of Ringwood H..
An interesting game was played in Dromana where Jets (#7) crushed host Sharks (#6) with 47-point difference 86-39 on Saturday evening. Jets held Sharks to an opponent 21.6 percent shooting from the field compared to 46.1 percent accuracy of the winners. Jets forced 23 Sharks turnovers and outrebounded them 48-28 including a 33-22 advantage in defensive rebounds. It was a great evening for Geralynn Leaupepe who led her team to a victory scoring 32 points and 9 rebounds. Karen Duever helped adding 18 points and 15 rebounds. At the losing side Canadian forward Megan Smith (185, college: RMU) responded with 19 points and Jamilee Pearce scored 8 points and 7 rebounds. Jets (3-2) moved-up to fifth place in League. Loser Sharks dropped to the seventh position with three games lost. Both teams do not play next round, which will be an opportunity for some rest. There was no surprise in Tullamarine where 5th ranked Cougars (2-3) were crushed by leader Hume City Broncos (5-0) 92-45 on Saturday. Hume City Broncos held Cougars to an opponent 22.5 percent shooting from the field compared to 35.0 percent accuracy of the winners. They outrebounded Cougars 77-35 including a 36-8 advantage in offensive rebounds. Hume City Broncos looked well-organized offensively handing out 21 assists comparing to just 4 passes made by Cougars' players. American forward Breanna Brock (187-90, college: Missouri, agency: Gamble Sports Management) fired a double-double by scoring 21 points and 20 rebounds for the winners. Forward Kristy Rinaldi (181-86) chipped in a double-double by scoring 10 points, 12 rebounds and 7 assists. Five Hume City Broncos players scored in double figures. Hume City Broncos' coach felt very confident using 11 players and allowed the starting five to rest. Ashlea Stainer produced 13 points and 6 rebounds and point guard Claire Ioannidis (170, college: N.Florida) added 15 points respectively for lost side. Hume City Broncos maintains first place in League with 5-0 record. Loser Cougars dropped to the sixth position with three games lost. Both teams do not play next round, which will be an opportunity for some rest. No shocking result in a game when second ranked Thunder (4-1) smashed on the road bottom-ranked Warrnambool (0-5) 99-49 on Saturday. Thunder dominated down low during the game scoring 64 of its points in the paint compared to Warrnambool's 24. Thunder forced 27 Warrnambool turnovers and outrebounded them 54-36 including a 20-6 advantage in offensive rebounds. They looked well-organized offensively handing out 21 assists comparing to just 8 passes made by Warrnambool's players. Great defensive blocking was one of the keys in this match when Thunder made 7 blocks. American forward Erin Bollmann (180-94, college: SEMO) fired 25 points and 9 rebounds for the winners. Aneta Bandilovski chipped in a double-double by scoring 18 points, 13 rebounds and 4 assists. Thunder's coach felt very confident using 11 players and allowed the starting five to rest. Abbey Sutherland produced a double-double by scoring 17 points and 10 rebounds and Jae Leddin added 13 points and 6 rebounds respectively for lost side. Despite that victory Thunder went down to third position (League) due to points difference. Newly promoted Warrnambool still closes the standings with five games lost. Both teams do not play next round, which will be an opportunity for some rest. Very expected game in Bulleen where bottom-ranked Boomers (0-5) were rolled over by third ranked Cavaliers (4-1) 90-55 on Sunday. Cavaliers dominated down low during the game scoring 54 of its points in the paint compared to Boomers' 28. Cavaliers forced 24 Boomers turnovers. They looked well-organized offensively handing out 27 assists comparing to just 10 passes made by Boomers' players. Tanarly Hood fired 23 points, 8 rebounds and 4 assists for the winners. American guard Sarah Halejian (175-92, college: Yale) chipped in a double-double by scoring 14 points, 11 rebounds, 8 assists and 4 steals. Antoniette Emma-Nnopu produced a double-double by scoring 14 points and 12 rebounds and forward Tessa Ramsay (185) added 13 points and 6 rebounds respectively for lost side. The winner was already known earlier in the game, so both coaches allowed to play the bench players saving starting five for next games. Cavaliers moved-up to second place in League. Loser Boomers still closes the standings with five games lost. Both teams do not play next round, which will be an opportunity for some rest. Undefeated Geelong Supercats (2-1) recorded its first loss in Seaford. Visitors were edged by seventeenth ranked Frankston Blues (1-2) 65-64. Strangely Geelong Supercats outrebounded Frankston Blues 49-37 including a 20-9 advantage in offensive rebounds. Worth to mention a great performance of Stephanie Reid who helped to win the game recording 18 points, 6 rebounds and 7 assists. 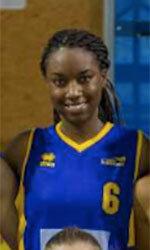 American guard JoAnna Smith (173-95, college: Buffalo) contributed with 17 points and 8 rebounds for the winners. The former international forward Sara Blicavs (188-93) answered with a double-double by scoring 16 points and 16 rebounds and center Isabelle Bourne (186-0) added 15 points and 8 rebounds in the effort for Geelong Supercats. Four Geelong Supercats players scored in double figures. Frankston Blues left bottom position moving up to twelfth place in League. Geelong Supercats at the other side dropped to the eighth position with one game lost. Frankston Blues will play against league's leader Lady Braves in Bendigo in the next round and it will be quite challenging to get another victory. Geelong Supercats will play at home against Wildcats (#7) and it may be a tough game between close rivals. Very important is a road loss of third ranked Wildcats (2-1) against seventh ranked Spectres (3-2) on Friday night. Visiting Wildcats were defeated by Spectres in East Burwood 89-72. Spectres dominated down low during the game scoring 64 of its points in the paint compared to Wildcats' 28. They outrebounded Wildcats 44-23 including a 18-6 advantage in offensive rebounds. Spectres players were unselfish on offense dishing 24 assists comparing to just 9 passes made by Wildcats' players. It was an exceptional evening for guard Eliza Chilcott (-90) who led the winners with a double-double by scoring 16 points, 10 rebounds and 7 assists. American swingman Kathleen Scheer (187-89, college: Duke) accounted for 18 points, 6 rebounds and 8 assists for the winning side. Four Spectres players scored in double figures. American point guard Chelsie Schweers (170-89, college: Chris.Newport) came up with 24 points and M Mulligan added 18 points and 5 rebounds respectively for Wildcats in the defeat. Both coaches used bench players which allowed the starters a little rest for the next games. Spectres moved-up to fifth place in League. Wildcats at the other side dropped to the seventh position with one game lost. Spectres will have a break next round. Wildcats will play on the road against Geelong Supercats (#8) and it may be a tough game between close rivals. Rather predictable result in Albury where ninth ranked Lady Bandits (2-1) beat 13th ranked Diamond Valley Eagles (1-3) 92-81 on Saturday. Lady Bandits shot the lights out from three sinking 12 long-distance shots on high 54.5 percentage. Center Jessie Edwards (192-95, college: Minnesota) fired a double-double by scoring 32 points, 17 rebounds and 5 assists for the winners. Guard Emma Mahady (179-92, college: California, PA) chipped in 17 points and 7 rebounds. Four Lady Bandits players scored in double figures. Swingman Anneli Maley (188-98, college: TCU) produced a double-double by scoring 21 points and 19 rebounds and Brianna Gregory added 17 points and 8 rebounds respectively for lost side. Diamond Valley Eagles' coach rotated ten players in this game, but that didn't help. Lady Bandits moved-up to sixth place in League. Loser Diamond Valley Eagles keep the thirteenth position with three games lost. Both teams do not play next round, which will be an opportunity for some rest. Not a big story in a game in Dandenong where bottom-ranked Ballarat Rush (0-3) was defeated by leader Rangers (4-0) 90-73 on Saturday. Rangers dominated down low during the game scoring 62 of its points in the paint compared to Ballarat Rush's 42. Rangers forced 19 Ballarat Rush turnovers. Ballarat Rush was plagued by 24 personal fouls down the stretch. American forward Colleen Planeta (188-88, college: Point Loma) fired a double-double by scoring 27 points, 12 rebounds and 5 assists for the winners. Guard Aimie Clydesdale (177-93) chipped in 28 points, 6 rebounds, 7 assists and 4 steals. Guard Georgia Amoore (167-1) produced 15 points and 6 assists and American swingman Olivia Hackmann (178-94, college: SEMO) added 13 points and 7 rebounds respectively for lost side. Both coaches tested many bench players and allowed the starting five to rest. Rangers maintains second place in League with 4-0 record despite having the same number of points like the leader Bendigo LB. Loser Ballarat Rush still closes the standings with three games lost. Both teams do not play next round, which will be an opportunity for some rest. There was a surprise result when thirteenth ranked Tornadoes (0-1) won against on the road 4th placed Hobart H. (2-1) 104-95 on Saturday. Sarah ONeill fired a double-double by scoring 23 points and 10 rebounds for the winners. American guard Stephanie Gardner (170-92, college: ODU) chipped in a double-double by scoring 19 points, 10 rebounds and 5 assists. Power forward Tayla Roberts (191-93) produced 27 points, 7 rebounds and 6 assists and Ellie Collins added 18 points, 10 rebounds and 11 assists respectively for lost side. Four Tornadoes and five Hobart H. players scored in double figures. Despite that victory Tornadoes went down to sixteenth position (League) due to points difference. Newly promoted Hobart H. dropped to the ninth place with one game lost. Both teams do not play next round, which will be an opportunity for some rest. There was no surprise in Kilsyth where 13th ranked Lady Cobras (1-3) were defeated by leader Lady Braves (4-0) 70-64 on Saturday. Lady Braves looked well-organized offensively handing out 24 assists. The former international center Gabrielle Richards (191-84, college: Oregon) fired a double-double by scoring 28 points and 12 rebounds (on 11-of-12 shooting from the field) for the winners. The former international guard Kelly Wilson (170-84) chipped in a double-double by scoring 15 points, 5 rebounds and 11 assists. Lady Braves' coach Megan Moody used a ten-player rotation and allowed the starting five to rest. Clare Camac produced 21 points and 6 rebounds and forward Klara Wischer (185-91, college: San Diego) added 16 points and 6 rebounds respectively for lost side. Lady Braves maintains first place in League with 4-0 record. Loser Lady Cobras dropped to the fourteenth position with three games lost. Lady Braves will face Frankston Blues (#12) in Seaford in the next round which should be an easy win for them. No shocking result in a game in Cheltenham where tenth ranked Knox Raiders (3-1) smashed bottom-ranked Sabres (0-3) 92-67 on Saturday. Knox Raiders looked well-organized offensively handing out 29 assists comparing to just 14 passes made by Sabres' players. Guard Abigail Wehrung (177-95) fired 21 points and 9 assists for the winners. New Zealand guard Rebecca Ott (182-94) chipped in 18 points and 5 assists. Four Knox Raiders players scored in double figures. The former international Rachel Jarry (185-91) produced 17 points and 7 rebounds and guard Amelia Todhunter (166-88) added 11 points and 7 rebounds respectively for lost side. Sabres' coach gave up on the game allowing to play eleven players seeing no chance for a win. Knox Raiders moved-up to fourth place in League. Loser Sabres still closes the standings with three games lost. Both teams do not play next round, which will be an opportunity for some rest. Everything could happen in Mount Waverley at the game between two tied teams. Both ninth ranked Tigers and 12th ranked Falcons had identical 1-2 record. But Falcons were not able to use a home court advantage and were edged by the opponent from Melbourne 72-69 on Saturday night. Tigers forced 19 Falcons turnovers. Althea Angeles fired 17 points and 9 rebounds for the winners. Naturalized British forward Louella Tomlinson (193-88, college: St.Mary's, CA) chipped in 8 points, 11 rebounds, 9 assists and 5 blocks. Forward Kelly Bowen (182-89, college: Gonzaga) produced 14 points and 8 rebounds and forward Tegan Cunningham (185-88, college: Oklahoma St.) added 13 points and 8 rebounds respectively for lost side. Falcons' coach rotated ten players in this game, but that didn't help. Despite that victory Tigers went down to tenth position (League) due to points difference. Loser Falcons dropped to the fifteenth place with three games lost. Both teams do not play next round, which will be an opportunity for some rest. Everything could happen in Wantirna South at the game between two tied teams. Both tenth ranked Knox Raiders and 9th ranked Tigers had identical 2-1 record. This time Knox Raiders used a home court advantage and outscored the opponent from Melbourne 104-72 on Sunday night. Knox Raiders looked well-organized offensively handing out 28 assists comparing to just 9 passes made by Tigers' players. 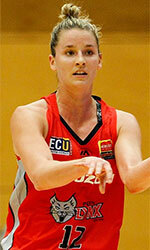 New Zealand guard Rebecca Ott (182-94) fired 28 points, 6 rebounds and 4 assists for the winners. Guard Abigail Wehrung (177-95) chipped in 19 points, 8 rebounds, 7 assists and 4 steals. Five Knox Raiders players scored in double figures. Naturalized British forward Louella Tomlinson (193-88, college: St.Mary's, CA) produced 24 points and 9 rebounds and point guard Monique Conti (165-99) added 29 points respectively for lost side. Knox Raiders (3-1) moved-up to fourth place in League. Loser Tigers dropped to the tenth position with two games lost. Both teams do not play next round, which will be an opportunity for some rest. Not a big story in a game in Heathmont where 13th ranked Lady Cobras (1-3) were defeated by leader Hawks (3-0) 68-51 on Sunday. Hawks forced 20 Lady Cobras turnovers. American guard Cassidy Mihalko (180-95, college: CBU) fired a double-double by scoring 22 points and 10 rebounds for the winners. New Zealand guard Antonia Farnworth-Edmondson (181-87) chipped in 21 points. Hawks' coach T Mottin used an eleven-player rotation and allowed the starting five to rest. American power forward Sarah Boothe (195-90, college: Stanford) produced 12 points and 9 rebounds and power forward Emily Fryters (188-82) added 8 points and 5 rebounds respectively for lost side. Hawks moved-up to third place in League. Loser Lady Cobras dropped to the fourteenth position with three games lost. Both teams do not play next round, which will be an opportunity for some rest. Everything went according to plan in Mt Gambier where fifth ranked Mount Gambier Pioneers (4-2) outleveled 10th ranked Rockets (2-5) 87-62 on Saturday. Mount Gambier Pioneers forced 20 Rockets turnovers. They looked well-organized offensively handing out 21 assists. American guard Amanda Frost (174-91, college: NAU) fired 34 points (!!!) and 5 assists for the winners. Emily Winter chipped in 20 points, 9 rebounds and 4 assists. Center Tayla Corrigan (190-93, college: Idaho) produced a double-double by scoring 17 points and 15 rebounds and Samantha Defrancesco added 13 points and 7 assists respectively for lost side. Rockets' coach gave up on the game allowing to play twelve players seeing no chance for a win. Mount Gambier Pioneers moved-up to fourth place in League. Loser Rockets keep the tenth position with five games lost. Both teams do not play next round, which will be an opportunity for some rest. There was no surprise in Mt. Barker where 9th ranked Tigers (2-4) were defeated by third ranked Mavericks (5-2) 78-66 on Saturday. Mavericks dominated down low during the game scoring 52 of its points in the paint compared to Tigers' 32. Mavericks forced 21 Tigers turnovers. American power forward Carmen Tyson-Thomas (180-91, college: Syracuse, agency: Two Points) fired 30 points and 8 rebounds for the winners (made all of her eight free throws). Brooke Basham chipped in 16 points and 5 rebounds. American guard TaRea Cunnigan (175-93, college: SJSU) produced 20 points and 5 rebounds and Isabella Stratford added 12 points respectively for lost side. Tigers' coach rotated ten players in this game, but that didn't help. Mavericks maintains third place in League with 5-2 record having just four point less than leader Bendigo LB. Loser Tigers keep the ninth position with four games lost. Mavericks will have a break next round. Tigers will play at home against Bearcats (#5) and hope to win that game. No shocking result in a game in Flinders Park where first ranked Sabres (6-1) defeated 6th ranked Warriors (3-4) 70-56 on Saturday. Sabres looked well-organized offensively handing out 21 assists. American guard Kylee Smith (180-94, college: Belmont, agency: Interperformances) fired 20 points and 6 rebounds for the winners. Kayla Mathews chipped in 18 points and 7 rebounds. Sabres' coach used an eleven-player rotation and allowed the starting five to rest. T Morrell produced a double-double by scoring 22 points and 13 rebounds (made all of her eight free throws) and American guard Sherrie Session (182-90, college: URI) added 12 points respectively for lost side. Sabres maintains first place in League with 6-1 record. Loser Warriors dropped to the seventh position with four games lost. Both teams do not play next round, which will be an opportunity for some rest. Rather expected game in Gawler where bottom-ranked Lions (0-7) were defeated by eighth ranked Panthers (3-3) 77-67 on Saturday. Panthers made 18-of-22 free shots (81.8 percent) during the game. They also forced 19 Lions turnovers. American guard Brianti Saunders (163-94, college: Stetson) fired 25 points and 8 rebounds for the winners. Forward Mollie McKendrick (183-93, college: Boston U.) chipped in a double-double by scoring 14 points and 11 rebounds. Four Panthers players scored in double figures. American guard Jazmen Boone (173, college: William & Mary) produced a double-double by scoring 25 points and 17 rebounds and Erin Schrapel added 10 points and 4 steals respectively for lost side. Lions' coach rotated eleven players in this game, but that didn't help. Panthers moved-up to sixth place in League. Loser Lions still closes the standings with seven games lost. Both teams do not play next round, which will be an opportunity for some rest. Rather predictable result in Marden where fourth ranked Eagles (5-2) outscored 7th ranked Flames (3-5) 71-49 on Saturday. Eagles held Flames to an opponent 23.2 percent shooting from the field compared to 35.9 percent accuracy of the winners. Gabriella Vidmar fired 20 points, 8 rebounds, 4 assists and 4 steals for the winners. Forward Chelsea Roberts (180-93, college: UT Martin) chipped in 14 points and 7 rebounds. Eagles' coach felt very confident using 10 players and allowed the starting five to rest. American forward Tess Bruffey (193, college: Lubbock Christian) produced a double-double by scoring 15 points, 10 rebounds and 6 blocks and Shannon Webber added 14 points, 7 rebounds and 4 assists respectively for lost side. Eagles moved-up to second place in League. Loser Flames dropped to the eighth position with five games lost. Both teams do not play next round, which will be an opportunity for some rest. Not a big story in a game in Bunbury where 8th ranked Cougars (2-3) were defeated by sixth ranked Slammers (4-2) 68-61 on Saturday. American forward Brittni Montgomery (190-92, college: Cent Florida) fired a double-double by scoring 21 points and 13 rebounds for the winners. Forward Courtney Bayliss (183-93, college: Our Lady Lake) chipped in 11 points, 8 rebounds and 5 assists. Slammers' coach used a ten-player rotation and allowed the starting five to rest. Vanessa Michael produced 13 points and 8 rebounds and Ruby Benn added 12 points, 5 rebounds and 5 assists respectively for lost side. Slammers moved-up to third place in League. Loser Cougars keep the eighth position with three games lost. Slammers will face Magic (#7) in Mandurah in the next round. Cougars will play at home against the league's second-placed Lightning and hope to win that game. Everything went according to plan in Morley where sixth ranked Slammers (4-2) outleveled bottom-ranked Eagles (0-6) 78-43 on Friday. Slammers held Eagles to an opponent 24.6 percent shooting from the field compared to 39.7 percent accuracy of the winners. Slammers forced 22 Eagles turnovers. They looked well-organized offensively handing out 54 assists. Great defensive blocking was one of the keys in this match when Slammers made 39 blocks. American guard Makailah Dyer (175, college: N.Dakota) fired 16 points and 9 assists for the winners. Her fellow American import forward Brittni Montgomery (190-92, college: Cent Florida) chipped in 10 points and 9 assists. American forward Janee Johnson (185-92, college: Seton Hall) produced 10 points and 9 assists and guard Fiona Heart (170-71) added 5 points, 5 rebounds, 6 assists and 5 blocks respectively for lost side. The winner was already known earlier in the game, so both coaches allowed to play the bench players saving starting five for next games. Slammers moved-up to third place in League. Loser Eagles still closes the standings with six games lost. Slammers will face Magic (#7) in Mandurah in the next round. Eagles will play at home against Suns (#10) and hope to get finally their first victory. Very important is a home loss of first ranked Lightning (4-1) against fifth ranked Tigers (4-3) on Friday night. Host Lightning was defeated by Tigers in a tough game in Bullcreek 67-76. Tigers dominated down low during the game scoring 46 of its points in the paint compared to Lightning's 22. Tigers forced 23 Lightning turnovers. They looked well-organized offensively handing out 46 assists. Great defensive blocking was one of the keys in this match when Tigers made 34 blocks. American power forward Laina Snyder (185, college: Ashland) fired a double-double by scoring 28 points, 20 assists and 4 steals for the winners. Desiree Kelley chipped in 17 points, 5 rebounds, 6 assists and 6 blocks. Power forward Ashleigh Grant (187-97) produced a double-double by scoring 11 points and 11 assists and American swingman Alison Schwagmeyer (177-90, college: Quincy) added 13 points, 9 assists and 4 steals respectively for lost side. Four Lightning players scored in double figures. Lightning's coach rotated ten players in this game, but that didn't help. Tigers moved-up to fourth place in League. Loser Lightning dropped to the second position with one game lost. Tigers will face Hawks (#9) in Floreat in the next round which should be theoretically an easy game. Lightning will play on the road against Cougars (#8) in Hamilton Hill and hope to win that game. There was a minor upset in Hamilton Hill where their close opponent Cougars (2-3) were defeated by eighth ranked Suns (2-4) 78-68 on Friday. Suns forced 20 Cougars turnovers. They looked well-organized offensively handing out 41 assists. Great defensive blocking was one of the keys in this match when Suns made 32 blocks. American power forward Jennie Rintala (188-90, college: S.Dakota St.) fired 19 points and 8 assists for the winners. Guard Lauren Jeffers (170-88) chipped in 14 points, 7 assists and 4 steals. Four Suns players scored in double figures. Power forward Matilda Muir (183-93) produced 23 points and 5 assists and forward Jodee Sontay (179-85) added 2 points and 12 assists respectively for lost side. Despite that victory Suns went down to tenth position (League) due to points difference. Loser Cougars keep the eighth place with three games lost. Suns will face Eagles (#12) in Morley in the next round. The game had a very big importance for second-ranked Wanneroo as it allowed them to take a leadership position in League. Wanneroo defeated 8th ranked Hawks in Joondalup 69-59. Wanneroo made 18-of-23 free shots (78.3 percent) during the game. American forward Kayla Steindl (187-89, college: Gonzaga) fired a double-double by scoring 20 points and 11 rebounds (made all of her seven free throws) for the winners. Forward Amy Kidner (183, college: N.Colorado) chipped in 14 points and 6 rebounds. Power forward Sarah Donovan (188-93) produced a double-double by scoring 17 points and 11 rebounds and guard Rebecca Benson (174-86) added 13 points and 4 assists respectively for lost side. As mentioned above they are alone now at the top position. Hawks at the other side dropped to the ninth place with three games lost. Hawks will play next round against strong Tigers trying to get back on the winning streak. Wanneroo will try to continue on its current victory against fifth ranked Flames in Rockingham. We could consider it a predictable result in the game between close teams in Perth where seventh ranked Senators (3-1) defeated 6th ranked Magic (3-3) 85-72 on Saturday. Senators made 23-of-29 free shots (79.3 percent) during the game. Bianca Villegas fired a double-double by scoring 13 points, 15 rebounds and 4 assists for the winners. Guard Stacey Barr (173-92, college: Idaho) chipped in 18 points, 9 rebounds and 4 assists. Guard Casey Mihovilovich (173-82) produced 21 points, 9 rebounds and 7 assists and Slovakian center Regina Palusna (192-89) added 16 points and 14 rebounds respectively for lost side. Both teams had four players each who scored in double figures. Both coaches tested many bench players and allowed the starting five to rest. Senators moved-up to sixth place in League. Loser Magic dropped to the seventh position with three games lost. Senators will face Redbacks (#11) in Northbridge in the next round which should be theoretically an easy game. Magic will play at home against Slammers (#3) and hope to win that game. Very expected game in Kalamunda where 8th ranked Suns (2-4) were defeated by second ranked Wanneroo (5-1) 80-66 on Sunday. Wanneroo looked well-organized offensively handing out 24 assists. American forward Kayla Steindl (187-89, college: Gonzaga) fired a double-double by scoring 13 points and 13 rebounds for the winners. The former international guard Mikayla Pirini (169-96) chipped in 14 points and 5 assists. Four Wanneroo players scored in double figures. Jewel Williams produced 16 points and Chanah Crugnale added 16 points and 6 rebounds respectively for lost side. Both coaches tested many bench players and allowed the starting five to rest. Wanneroo keeps a position of League leader. Loser Suns dropped to the tenth place with four games lost. Wanneroo will face Flames (#5) in Rockingham in the next round. Suns will play on the road against Eagles (#12) in Morley and it may be a tough game between close rivals. Rather predictable result in Crows Nest where fifth ranked North Bears (5-3) beat 8th ranked Panthers (2-5) 75-57 on Saturday. North Bears dominated down low during the game scoring 46 of its points in the paint compared to Panthers' 24. North Bears forced 20 Panthers turnovers. They looked well-organized offensively handing out 25 assists. Swingman Emily Simons (178-94, college: Pacific) fired 16 points and 5 steals for the winners. Austrian center Sarah Schicher (187-90, college: Dowling) chipped in 5 points, 8 rebounds and 4 assists. American Megan Jefferson (, college: High School) produced a double-double by scoring 20 points and 10 rebounds and Natalia Beaumont added 8 points and 11 rebounds respectively for lost side. Both coaches tested many bench players and allowed the starting five to rest. North Bears maintains fifth place in League with 5-3 record. Loser Panthers dropped to the ninth position with five games lost. Both teams do not play next round, which will be an opportunity for some rest. Not a big story in a game in Condell Park where 7th ranked Comets (2-5) were defeated by fourth ranked Bruins (6-1) 52-44 on Saturday. Briana Maimone fired 19 points, 6 rebounds and 5 assists for the winners. Tasmyn Haynes chipped in 18 points and 5 rebounds. Guard Emily Matthews (178-99) produced 21 points and 5 rebounds and Lauren Breen added 5 points and 6 rebounds respectively for lost side. Bruins moved-up to second place in League. Loser Comets dropped to the eighth position with five games lost. Both teams do not play next round, which will be an opportunity for some rest. Everything went according to plan in Narrabeen where leader Hunters (6-0) outleveled 9th ranked Manly Warringah Sea Eagles (2-5) 89-49 on Saturday. Hunters outrebounded Manly Warringah Sea Eagles 46-34 including 34 on the defensive glass. They looked well-organized offensively handing out 22 assists comparing to just 8 passes made by Manly Warringah Sea Eagles' players. Jaimee Seebohm fired a triple-double by scoring 17 points, 12 rebounds and 10 assists for the winners. Center Lara McSpadden (193-99) chipped in 20 points and 7 rebounds. Four Hunters players scored in double figures. Hunters' coach felt very confident using 10 players and allowed the starting five to rest. Forward Kimberley Hodge (182-98) produced a double-double by scoring 30 points and 19 rebounds and Antonia Henderson added 10 points respectively for lost side. Hunters maintains first place in League with 6-0 record. Loser Manly Warringah Sea Eagles dropped to the tenth position with five games lost. Both teams do not play next round, which will be an opportunity for some rest. There was a minor upset in Baulkham Hills where their close opponent Crusaders (1-6) were crushed by eleventh ranked Hills Hornets (2-4) 87-55 on Saturday. Hills Hornets held Crusaders to an opponent 23.3 percent shooting from the field compared to 44.2 percent accuracy of the winners. They outrebounded Crusaders 59-37 including a 39-24 advantage in defensive rebounds. American guard Leah Cotton (173-91, college: Minnesota) fired 23 points and 5 rebounds for the winners. Wendy Strong chipped in 9 points and 20 rebounds. Four Hills Hornets players scored in double figures. Jacinta Govind produced 9 points and 12 rebounds and guard Lauren Faulkner (170-95) added 15 points and 6 steals respectively for lost side. Hills Hornets moved-up to seventh place in League. Loser Crusaders keep the eleventh position with six games lost. Both teams do not play next round, which will be an opportunity for some rest. No shocking result in a game in Hornsby where fourth ranked Spireds (6-1) defeated bottom-ranked Mustangs (0-7) 72-55 on Saturday. Point guard Sarah Graham (163-89) fired 21 points and 5 rebounds for the winners. American power forward Rachel Maenpaa (185-84, college: Indiana St.) chipped in a double-double by scoring 11 points and 13 rebounds. Shakera Reilly produced 13 points and American forward Alyssa Bennett (188-90, college: Hampton) added 1 points and 15 rebounds respectively for lost side. Spireds moved-up to third place in League. Loser Mustangs still closes the standings with seven games lost. Both teams do not play next round, which will be an opportunity for some rest. Very expected game in Sutherland where 6th ranked Nationals (3-3) were defeated by second ranked Sharks (6-1) 82-73 on Saturday. Sharks made 17-of-21 free shots (81.0 percent) during the game. They looked well-organized offensively handing out 21 assists. Point guard Shyla Heal (167-1) fired 27 points, 5 rebounds and 8 assists for the winners. Madeleine Norris chipped in a double-double by scoring 18 points, 10 rebounds and 5 assists. Four Sharks players scored in double figures. Sharks' coach used a ten-player rotation and allowed the starting five to rest. Forward Keely Froling (188-96, college: SMU) produced a double-double by scoring 26 points, 18 rebounds and 4 assists and point guard Abby Cubillo (161-99) added 24 points and 5 rebounds respectively for lost side. Despite that victory Sharks went down to fourth position (League) due to points difference. Loser Nationals keep the sixth place with three games lost. Both teams do not play next round, which will be an opportunity for some rest. Very predictable result in Terrigal where fifth ranked North Bears (5-3) outscored 11th ranked Crusaders (1-6) 82-37 on Sunday. North Bears held Crusaders to an opponent 25.0 percent shooting from the field compared to 45.2 percent accuracy of the winners. North Bears forced 27 Crusaders turnovers and outrebounded them 48-30 including a 34-21 advantage in defensive rebounds. North Bears looked well-organized offensively handing out 24 assists comparing to just 7 passes made by Crusaders' players. Great defensive blocking was one of the keys in this match when North Bears made 7 blocks. Swingman Emily Simons (178-94, college: Pacific) fired 26 points and 7 rebounds (on 11-of-14 shooting from the field) for the winners. Guard Kate Seebohm (170-91, college: California, PA) chipped in 11 points and 4 steals. North Bears' coach felt very confident using 10 players and allowed the starting five to rest. Jordan Kimbrough produced a double-double by scoring 12 points and 10 rebounds and Lucy Chapman added 10 points respectively for lost side. North Bears maintains fifth place in League with 5-3 record. Loser Crusaders keep the eleventh position with six games lost. Both teams do not play next round, which will be an opportunity for some rest. There was a minor upset in Condell Park where much higher ranked Sharks (6-1) were outplayed by fourth ranked Bruins (6-1) 71-52 on Sunday. It was a key game for the second position in League. Bruins dominated down low during the game scoring 46 of its points in the paint compared to Sharks' 26. They looked well-organized offensively handing out 23 assists. Tasmyn Haynes fired 27 points for the winners. Briana Maimone chipped in 19 points and 5 assists. Point guard Shyla Heal (167-1) produced a double-double by scoring 20 points, 10 rebounds and 5 assists and Melinda Andriejunas added 10 points and 10 rebounds respectively for lost side. Sharks' coach tested eleven players seeing no chance for a win. Bruins moved-up to second place in League. Both teams do not play next round, which will be an opportunity for some rest.